Sometime you get a roommate that comes with extra perks. If they work at a restaurant they bring you free food. If they work at a store they can get you discounts. Hopefully they work somewhere and can get you their share of rent. Now that’s a clever name for today’s comic! 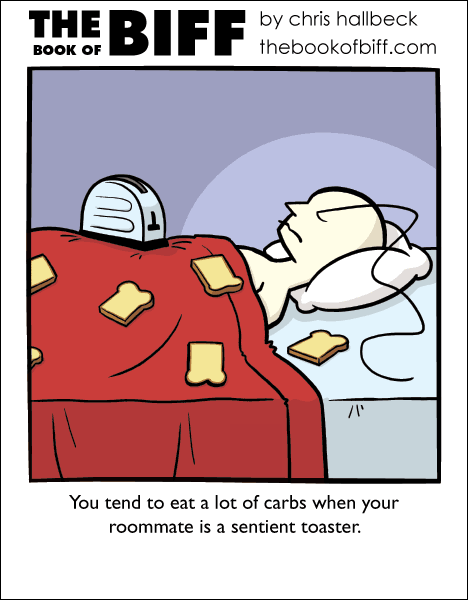 And does the toaster perhaps wear a pair of loafers when it’s loafing around? Ahhh, so you’re a waffle man ! In case you don’t want crumbs in your bed, make sure you have a stereo playng Jackie Wilson in a different room.